(Northampton, MA) Sixty million books sold. Translations into over 50 languages. Three movies with another on the way. Diary of a Wimpy Kid is a children’s literature powerhouse on par with the Harry Potter books. Diary of a Wimpy Kid author Jeff Kinney will read from his books and meet and greet fans starting at 10am at the 9th Annual Meltdown Family Music and Book Fest Saturday at Smith Vocational and Technical High School in Northampton. Meltdown runs 10am-4pm. Doors open at 9:30 to accommodate Jeff Kinney fans. Meltdown is free and open to all, and is the creation of the Northampton Radio Group (WRSI The River, WHMP and Hits 94.3). Meltdown offers three stages of Grammy-winning musicians, award-winning authors, puppets and storytellers, plus a petting farm, bounce houses, circus, food court, giant Hot Wheels track, vendors and so much more. “Meltdown has become the unofficial end-of-winter celebration for families with young children,” says Mark Lattanzi, Event Director. “We are unbelievably lucky to have Jeff Kinney joining us this year, along with other world class family musicians and authors, like Latin Grammy winner Mister G, bestselling author/illustrator Jarrett J. Krosoczka, and so many more.” Each year over 3,000 adults and kids attend. 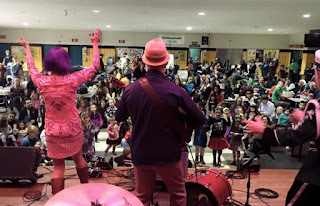 “Kids love Meltdown, whether it’s bouncing in one of the two bounce houses, petting the farm animals, watching circus performers, playing with the giant Hot Wheels track, dancing to the music, or catching a story or puppet show. And despite the name, there are very few actual meltdowns at Meltdown – it’s all fun!” says Lattanzi. Meltdown also offers a food court filled with local restaurants and plenty of room to roam for families with young children. Kids aged toddler through elementary school age will find plenty to enjoy at Meltdown. Meltdown is the creation of the Northampton Radio Group: WRSI 93.9 the River; WHMP; and Hits 94.3. It’s supported by Yankee Candle Village and several other local sponsors.